Honda Civic Ti special edition revealed | What Car? This is the Honda Civic Ti, a sporty special edition that's inspired by Honda's British Touring Car Championship (BTCC) Civic. The Civic Ti is based on the 1.8 i-VTEC SE petrol model. It gets a range of cosmetic upgrades over the entry-level trim, including 17-inch wheels and colour-coded wheelarches. There are no mechanical changes. Inside, the Ti adds a leather-trimmed steering wheel and gearknob, and Bluetooth connectivity. Team Dynamics Motorsport which builds Honda's BTCC Civic supplies the 'Le Mans' alloy wheels for the Civic Ti. 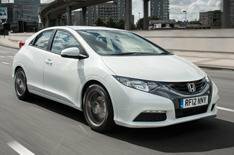 Only 1,000 Civic Ti models will be built, and buyers have a choice of white, red or silver paintwork. The Civic Ti goes on sale in October, at 16,995 1175 less than the 1.8 SE model it's based on.